After a few weeks in Bonegilla we moved to Beechworth in Victoria. 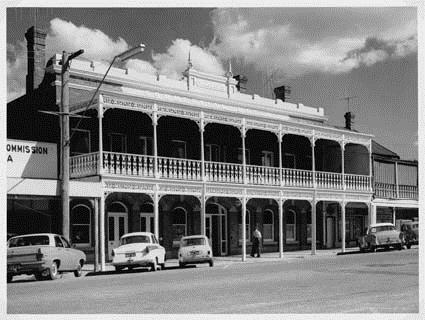 In Beechworth, my step-father John immediately began work at Zwar's tannery and we lived in one tiny room of the house of the person who had 'sponsored' John. My mother Lisa absolutely hated it, but nothing else was available, at least none that we could afford. After a couple of weeks John learnt of a dilapidated house 3 miles out of town. The owners of the house, the Blumes, a brother and two sisters, lived on their little dairy farm half a mile down the gully, and they were reluctant to let us rent the unused part of the house. The empty rooms were not considered habitable, I assume. Eventually they gave in and we moved to the farming area that was then called Baarmutha. Our rent was 5 shillings per week. To get to the tannery, John bought himself a new bicycle, and one also for Lisa who needed it to get to her job in town. That would have stripped them of any savings they had made - possibly they bought them on hire purchase. At first, Lisa dinked me to school of a morning on the back of her bike and then waited after her maid's duties to take me home. After a couple of weeks she merely dinked me in of a morning and I walked the 3 miles home by myself after school. That became the routine for the 10 months we lived in Baarmutha. As the years went by, more and more European displaced persons settled in Beechworth and our small group of 1949/50 immigrants expanded to include some of the new settlers. Parties on a shoestring were held a few times a year around various houses plus the odd daytime outing. Without extended families or childhood friends around, the immigrants had to depend on each other for support and socialising, to most of the locals we were 'bloody New Australians' and generally avoided. Undoubtedly, there was a great need for a sense of belonging for the various immigrants, and in the absence of close relationships with Australians, they were thrown into each other’s arms.